In this section we provide a brief description of some of the people we know who are doing Torah code work or who have written about Torah code research. Drosnin's first book in 1997 influenced Barry Roffman to research Torah codes. Roffman had a hypothesis that if anything is encoded, it certainly would be that the Ark of the Covenant and its location would be encoded. As he began to develop tables he saw the beginning characters of ELSs in the table as relating to the beginning characters of other ELSs as a course direction in a north south east west sense. He developed this hypothesis into the book Ark Code, published in 2004, in which he hypothesizes, on the basis of these kinds of relationships, locations just off the Egyptian coast in the Mediteranean Sea where the Ark of the Covenant should be located. The basis for Mr. Roffman's Torah code work on the Ark of the Covenant are tables having the key word for Ark of the Covenant and Jerusalem plus names of places that satisfy a constraint which makes them interesting to Mr. Roffman. There are two places just on the coast of Egypt that Mr. Roffman finds interesting. They are Zuqba and Bardawal. The table below has all the four key words. From the י of ירושלם, Jerusalem, to the צ of צקב, Zuqba, it is 7 rows down and 22 columns across. A triangle with opposite side of 7 and base of 22 has an angle whose tangent is 7/22=.3182. The angle is the arc tangent of .3182 which is 17.65 degrees. Starting from north, which he aligns with the top of the table, and rotating clockwise to 270 degrees less 17.65 degrees comes to 252.35 degrees. Zuqba is interesting because the geographic course heading from Jerusalem to Zuqba is 252.35 degrees. A similar kind of reasoning indicates that Bardawal is interesting. This is a table shown that the heading from ELSs of Jerusalem to Zuqba of the table agrees with the geographic course heading. Mr. Roffman uses the interactive Code Finder program which permits ELSs to wrap around the Torah. Mr. Roffman does not use the analytic calculation the Code Finder program makes to determine p-values. Rather, he has developed his own way of doing an analytic calculation that approximates a p-value. His calculation is better than that in the Code Finder program. Sometimes it is close, but it is not unusual for it to be off by an order of magnitude. The only proper way to estimate a p-value is by a Monte Carlo experiment and none of the commercially available software does that. More tables can be found on Mr. Roffman's website. Art Levitt began exploring Torah codes from about 1997, influenced by a Discovery Seminar, and has worked with Professor Rips. He is a careful researcher, always employing proper protocols, and his p-value estimates are conservative (meaning that the true p-values are much lower than his estimate). He presented several papers at the 2006 International Conference on Pattern Recognition. His most recent study is with Divine Names. His website can be found at www.torahcodes.net. There are a number of people who have done work in Torah codes, not all of them well known. Nachum Bombach worked with Torah codes from the mid 1990's. His website can be found at torahcodes.org. He and Mr. Gans presented a paper at the 2006 International Conference on Pattern Recognition and with others another paper at the same conference. Igor Pisetski and Chaim Stahl worked with Torah codes from the late 1990's. Although they have found many interesting tables, their work is not on any website. Dr. Leib Schwartzman worked with Torah codes from the late 1990's. He prefers working with minimal skip ELSs and has developed the dialog technique. Some of his tables are on this website. Boaz Metzger has worked with Professor Rips and has a website at http://torah-codes.com. Rabbi Glazerson views Torah codes as one of the methods of Torah interpretation in the same category as gematria. He interprets tables from a Torah point of view, letting the table reinforce the teaching of traditional Judaism. Rabbi Glazerson develops Torah code tables always with a context. His context is the verses in the Torah that are in the table and the commentary of the Sages' homiletic and esoteric interpretations of these verses. Therefore, Rabbi Glazerson brings out additional key words, related to the teachings of the sages, the oral teachings as discussed in the Medrash and in Kabbalah. Because his knowledge of the Medrash is extensive, he is often able to select key words for a topic which is discussed in the Medrash and which relates to an historical event or a Torah concept. From the mid 1990's he began using Torah code tables to reinforce his lectures on Torah. In 2001 he published the book The Twin Towers in Torah codes. He, like Professor Rips, uses the Rotenberg SofSof Torah interactive Torah code program. 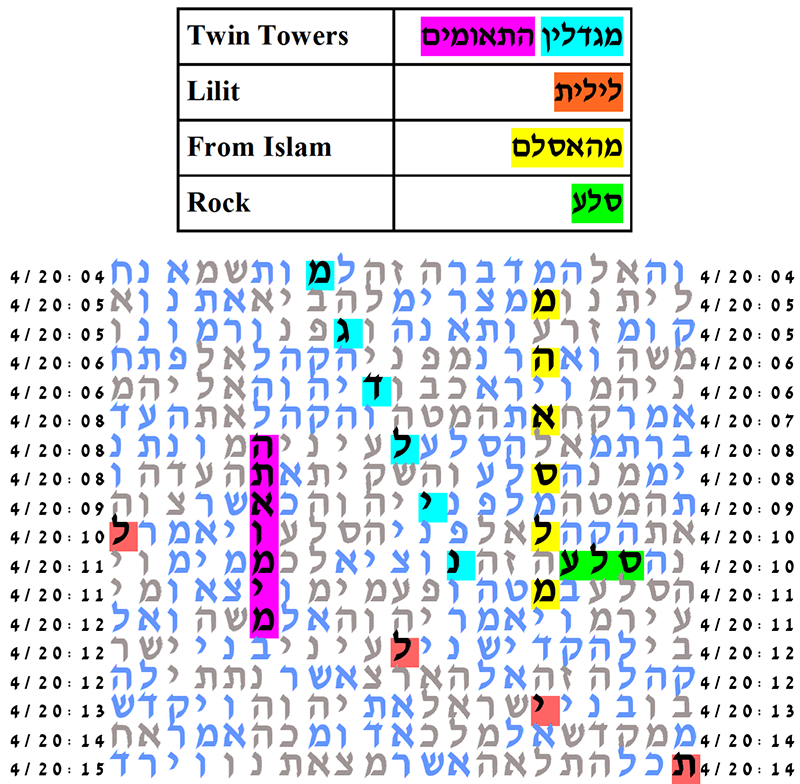 The Torah code tables he develops in the book about the Twin Towers all involve short skip ELSs which he shows in the text itself, without making special tables extracted as windows on a cylinder. To illustrate the nature of Rabbi Glazerson's method of table interpretation, we consider a table about the Twin Towers shown below. The table includes the key words forming the sentence: Twin Towers Attack With Airplane Against Edom from Islam. The cylinder size is 36. With expected number of ELSs set to 25, the probability that a text from the ELS random placement text population would have as small an area table as the one produced from the Torah text is less than 1/1,000,000. On this table Rabbi Glazerson explains that the gematria of twins, התאומים, is 502. This equals the gematria of the metaphorical twins: Yishmael, ישמעאל, which has gematria 451 plus Edom אדום, which has gematria 51. The Kingdom of Christianity is considered to be Edom. So Edom includes Europe, the countries of the North American Continent, Australia, and New Zealand. At this time of history the lead country of Edom is the United States. The Kingdom of Yishmael is considered to be the Arab countries of the Middle East. Yishmael is encoded in this same text area but its ELS has the small skip of 11 so to see it we must use a smaller cylinder size. A table showing the ELS for Yishmael is shown below. The cylinder size is 12. With expected number of ELSs set to 25, the probability that a text from the ELS random placement text population would have as small an area table as the one produced from the Torah text is 20/10,000. The two twin towers tables shown above occur in the text spanning Numbers chapter 19 verse 11 through Numbers chapter 20 verse 14. The text material of Numbers chapter 20 begins with the death of Miriam. And as the Midrash explains, there was a well called Miriam's well. As the Jews wandered through the wilderness, lacking adequate water would have been fatal. In the merit of Miriam, God provided a moving well of water, one which followed the people throughout their wanderings until the moment of her death. When Miriam died, so did that well. Thus, there was no more water. And this is why the Israelites complained about the lack of water after Miriam's death. Moses raised his arm and struck the rock with his staff twice; abundant water came forth and the assembly and their animals drank. The Hebrew of this verse is on the first table about six rows from the bottom. The symbolism of the rock, סלע, that Moses struct, can be understood by words formed from its letters: ס, ל, ע. These words are all associated with the forces of evil. The first word begin with its first letter ס, samech, סמאל, Samael. Samael is the heavenly minister of the biblical character Esau. The principal characteristic of people who have internalized some spiritual similarity to Samael is haughtiness. The second word begins with its second letter ל, lamed, לילית, Lilit. Lilit is the wife of Samael. The biblical character associated with Lilit is Hagar, the mother of Ishmael. The principal characteristic of people who have internalized some spiritual similarity to Lilit is desire, in the sense of lust. Hence the connection of Lilit to Yishmael. The third word begins with its third letter ע, ayin, עור, Or. Or, literally, skin, represents the covering, the shell, Kabbalistically the Klipah, that joins the two of them together. Given this analysis, it should be no surprize that both Samael and Lilit appear as ELSs in the same text area. The ELS for Samael has a skip of 16 and that of Lilit has a skip of 67. Notice that the ELS for Samael begins with the samech of rock. These tables are shown below. The cylinder size is 18. With expected number of ELSs set to 50, the probability that a text from the ELS random placement text population would have as small an area table as the one produced from the Torah text is smaller than 1/100,000. The ELS for skin, was snooped, and was not part of the experiment. The cylinder size is 36. With expected number of ELSs set to 50, the probability that a text from the ELS random placement text population would have as small an area table as the one produced from the Torah text is smaller than 1/10,000. is 451, equal to the gematria of ישמעאל, Yishmael. Rabbi Glazerson teaches that the Zohar (Exodus Parshat Vaera 32:1). speaks of three wars that Yishmael will declare. In the future, Yishmael will declare three fierce wars in the world and the descendants of Edom will gather against the descendants of Yishamel and fight three battles, one at sea, one on land and one near Jerusalem. Evidently, the attack on Afghanistan marked the beginning of the battle on land. Rabbi Glazerson teaches that because The World Trade Center, The Twin Towers, was one of the world's financial centers which housed gold and diamonds and because it was the location of the largest offices of the finance world's movers and shakers, that these towers symbolized the arrogance which stems from wisdom. He notes that the gematria of מגדל, tower, is 77 and equals the gematria of חכמה plus its number of letters. As already mentioned, the gematria of התאומים is 502 and this is the gematria of Yishmael plus Edom since the arrogance and lust that the towers represented are the forces of Yishmael and Edom. In 2004, Rabbi Glazerson published the book קץ שם לחשך, the End of Darkness. This book relates Torah code tables to kabbalah, repentence, and salvation. In 2005, with Professor Haralick, Professor Rips, he published the book Torah Codes: A Glimpse of the Infinite, a book that discusses technical and statistical protocol issues as well as answering various Torah code critics and then has within it a set of remarkable Torah code tables of recent historical events. In 2005 he published the book הצונאמי בדילוגים, The Tsunami in Skips (Torah Codes. In 2006, Rabbi Glazerson published the book Yisrael - Yishmael, Israel and Ishmael a book full of tables relating to the Palestinian and Arab leaders, all of whom wish to destroy Israel. Also in 2006 Rabbi Glazerson published the book בדילוגים והאור הגנוז, The Skips and the Hidden Light, a book with many Chanukah related Torah code tables. In 2008,he along with Professor Haralick, continued working on the theme of the conflict between Hamas and Israel. The 2008 book was called Yishamel Yisrael in Torah Codes. Also in 2008, he published a book of the Holocaust in Torah codes. Most recently, he and Professor Haralick published a book on the theme of the Kabbalah interpretation of 2012, as one of the years auspicious for the arrival of the Messiah and related this to some of the teachings of the Mayan culture, all supported by Torah code tables. The book's title is The Mayan Culture and Judaism. His newest book is Bible Code and Kabbalah (2010). In the late 1990's Dr. Robert Wolf and Joe Gallis became interested in Torah codes. They use a protocol that only considers positive skip ELSs whose absolute skip is generally 100 or less. The key words are pertinent to the Torah verses they are encoded within and the interpretation of the code is always with respect to the Torah tradition. In 1999 they published their book Between the Lines and a second volumne with the same title was published in 2001. In 2003, they joined with Rabbi Glazerson and Professor Haralick to publish the book Light Out of Darkness, subtitled Surviving the End of Days. Wolf and Gallis show ELSs in the text of the Torah rather than making tables. This has the advantage of not requiring resonance among the ELSs that are part of the study. It has the disadvantage of no table and there is not statistical evaluation of their findings. In their second book Between the Lines they discuss the impeachment of Clinton. The key word Clinton occurs as an ELS in Genesis Chapter 34, the chapter tells of an illicit sexual relationship between Schechem, a non-Jewish King, and Dinah, a daughter of Jacob. The parallel between this and what occurred with President Clinton and Monica Lewinsky is striking. In this section there is an ELS for the key words impeachment, liar, and adulterer. The prosecutor was Kenneth Starr and the key word star appears in the same section. This is shown in the table below. This table is not statistically significant. But the place it occurs in the Torah is related to the key words. Edwin Sherman became interested in Torah codes in the late 1990's and founded the Isaac Newton Bible Code Research Society. Mr. Sherman holds the point of view that three to six letter ELSs are everywhere and their individual appearance either alone or in compact formations with other short length ELSs are only indicative of chance occurrences and relationships. Thus he considers as not significant the tables in all the various Torah code books, as well as the tables which are produced by explicit protocols for Monte Carlo experiments resulting in unbiased estimates of p-values. His position cannot be statistically supported. Mr. Sherman has a website that has many examples of his extended ELS phrases, even 50 or 60 letters long. He believes that his website has the highest quality and longest Torah codes being published. He developed a Markov chain methodology for analytically evaluating ELS phrase lengths formed by starting with an ELS and seeing what possible prefix and suffix extensions it has. He explained his methodology in his book Biblecode Bombshell that was published in 2004. There is a quarrel in his speeches. A living brother uttered words to them and to me. And Zubaidah turned to his sea, without then lying for a whole week. Oh, the mountain of her interior will bear a testimonial to her name. The word that Dr. Jacobi translates as to them is לם. This is not a word in Hebrew. The proper Hebrew word for to them is להם. The word that Dr. Jacobi translates as lying is בד. But this word comes from the root בדה, meaning made up or fabricated like cloth, material, canvas and not meaning lying. Furthermore, its form is grammatically incorrect regardless of it meaning. Dr. Jacobi translates יעיד שמה to her name but the correct translation is her name. Taking the four sentences as a whole, even with the improper translation, one wonders what is its meaning? It is not intelligible. Under what circumstances would anyone ever utter such nonsense? Or, from another point of view, if such a set of sentences were to be uttered, our first thought is that the man uttering them must be a crazy man. As a proper Hebrew sentence, it does not make any sense. And it is not correct according to Hebrew grammar. It is absolutely not intelligible. No fluent speaker of Hebrew would consider it as coming close to anything meaningful. On page 125 of his book Biblecode Bombshell, (2004), Mr. Sherman states that the odds of of the 61 character long extension from Ezekiel 37, calculated analytically using a .194 extension (discovery) rate, is 1:4,415 trillion. There is a basic problem with Mr. Sherman's odds. The extension rate for extensions from a lexicon consisting of the words in the Tanach, is much greater than the .194 fraction he used. Our empirical studies have shown that with probability close to 1, the extension length for a given ELS at a given skip will be between 45 and 70 letters. Thus extension lengths of between 45 and 70 characters that just consist of words from a lexicon are common. It is only the intelligibility of a long ELS that makes the extension interesting. For those interested, scientific protocols for evaluating intelligiblity of long ELS phrases can be found in the paper by Levitt et. al. We would advise Mr. Sherman and Dr. Jacobi to validate what they do by following such a protocol. Daniel Stochel began working with Torah codes in 1999. The Zohar comments that there is a place in Torah that has the secrets of the end of days. This place is in the Parsha or portion of the Torah known by the name Veyechi. It is located from Genesis 47:28 through Genesis 50:26. The Zohar says that everything that will happen to the Jewish Nation in the End of Days is sealed and hidden in Veyechi. Stochel's table is actually a cluster of layered tables each of which reveals colorful details about the End of Days given in the blessings of Yaakov to his twelve children. The Matrix and all of its vast findings will be released along with his book Until the Hour of Redemption which he is in the process of completing. He hopes to complete them both in 2011 in time for those final days. He has a website with all of his tables, but at this time it is not public. Moshe Shak began working on Torah codes in about 2000. Many of the tables he has done can be found at Shak webpage1 and at Shak webpage2. He wrote a book Bible Codes Breakthrough that was published in 2004. The book explains the interactive protocol he developed and has many Torah code tables. His interactive protocol begins with a minimal skip term and selects ELSs that have sufficiently large R-values and pays attention to redundancy. Mr. Andy McKracken has an extensive website of his own work and many others including Mr. Lyuben Piperov, Mr. Fabrice Bect, Mr. Jimmie Cash, Mr. Jim Wright, and Mr. Al Sutton . Many of the tables appearing on Mr. McKracken's website have key words that are not so clearly related to the main topic of the table. Some of the tables are relatively large, and certainly not compact. Mr. McKracken and Mr. Jim Wright use the Keys to the Bible software. Of the researchers in this group, Mr. Piperov's Torah code writings relate to a wide variety of topics; he thinks broadly and technically, using mathematics and probability derivations to support his conclusions. His most recent study is about symmetry. And in the prophecy of Baalam. Mr. Piperov was particularly interested in the verse from Psalm 2 which qualifies scepter with iron. There the translation for scepter, שבט, is rod and the phrase is iron rod. Mr. Piperov writes: Therefore, it seemed interesting to check if there is any statistically significant occurrence of the key word שבט ברזל, iron rod, as an ELS. Surprisingly, the smallest greater than 1 skip occurs in the Book of Leviticus. But what seems to be most amazing is that it intersects the very verse, where the God has stated regulations Aaron should adhere to for the sin offering. The procedure includes breaking the used earthen utensils or clay pots, but sparing those made of copper. The cylinder size is 37. The table spans from Leviticus 6:21 through Leviticus 7:3. Remarkably, an ELS for the key word iron rod occurs right in a section that discusses the breaking of earthenware vessels that had absorbed the taste of the sin offering and therefore became impure and had to be shattered. Professor Haralick gives the following interpretation for Mr. Piperov's table. They had to be shattered because the contamination of an earthenware vessel from impurity cannot be washed away with water. To understand the relationship between the scepter of the Messiah and the breaking of the contaminated earthenware vessel, recall that God made mankind from the earth. So earthenware vessel is a metaphor for people. In the war of Gog and Magog, it is the iron rod of the Messiah who will break the impure earthenware vessels, meaning those people and nations who stand against God. Shattering the impure earthenware vessels means obliterating from existence those who stand against God. We have grouped the following researchers together because they all use Kevin Acres' Code Finder program and show the goodness of the tables they construct in terms of the odds ratio that the Code Finder program calculates. Roy Reinhold began working on Torah codes in about 2000. He is a promoter of the Code Finder Bible code program. His website contains a variety of Torah code tables as well as tutorials on codes and how to use the Code Finder program. 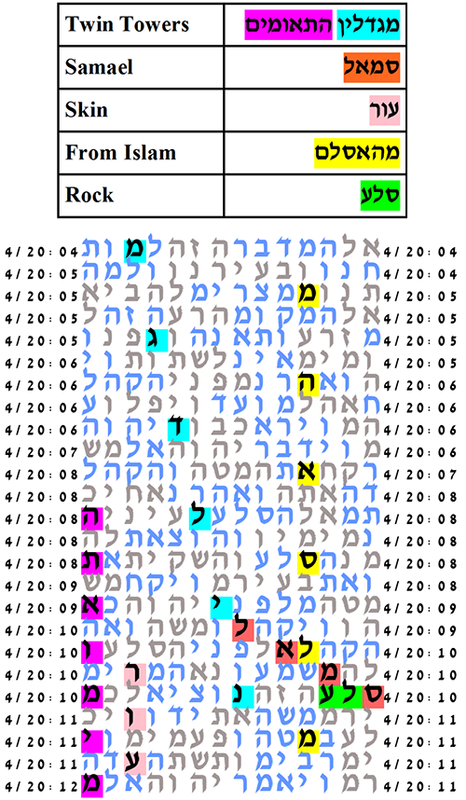 His site as well hosts tables produced by other Torah code researchers. Mr. Reinhold has a hypothesis that what is encoded is encoded in clusters of compact tables that are nearby to each other. This hypothesis is interesting and deserves to be formally stated and statistically tested. Therefore many of his tables are large with two or more clusters nearby to each other. His website can be found at http://ad2004.com/Biblecodes. Mr. Fabrice Bect became interested in Torah codes in the late 1980's after reading about some the results of Rips and Witztum. Mr. Bect found particularly interesting the tables found by (WRR) in their Hebrew University report and the subsequent book of Witztum. An ELS of the key word Bastille occurs near an ELS of the key word for Revolution, referring to the French revolution of 1789. This ELS for Bastille crosses the phrase from the surface text "the prison, a place where the king's prisoners are held". Bastille is a key word since the storming and fall of the Bastille was the flashing point of the French Revolution: http://en.wikipedia.org/wiki/Storming_of_the_Bastille). Moreover, around the axis term appear "satellite words" that are related to the main term from the meaning point of view. 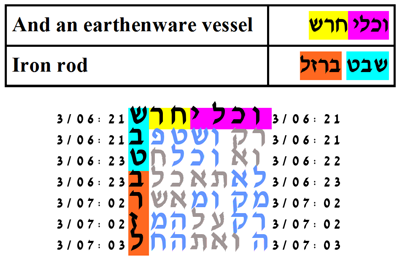 But this is not all: if one starts all over again all the operation using another word whose meaning is the same as the first term, this second main term and its satellites appear in the same location as the preceding series, which means that the words with the same meaning are geometrically close to each others in the text of the Torah. He has tables on a number of different websites, no one website necessarily having all the tables. Some can be found on McKracken's website others on and yet others on. In addition to the Code Finder software, Mr. Bect also uses the ABD Pro software and sometimes The Keys to the Bible software. This is Mr. Bect's approach to finding tables. First he selects the main key word and finds all the ELSs of this key word. This key word is the axis key word. He begins with the smallest skip ELS of the axis key word. Then he looks to see if this ELS is nearby a word, or an expression, or a verse, or a text with a related meaning. Finally, by dividing the cylinder size by 2, 3, 4 etc. he looks for ELSs of other words that are relevant to the topic. Mr. David Bell has tables on his website. Some of the tables are his own and some of the tables he has obtained from other websites. As mentioned initially, all these researchers uses the Code Finder program's odd's ratio calculation or its inverse, the p-value probability, in evaluating their tables. Unfortunately, the p-values calculated by the Code Finder program are not correct and do not correspond to the probability of any conceivable Torah code experiment. It is not unusual for the score the Code Finder produces to be three or four orders of magnitude too small. For a complete technical discussion about this read Code Finder: Scores or Probabilities. A variety of technical papers on Torah codes can be found at http://www.torah-code.org/papers.shtml.